Here is the ultimate collection of 500 delicious and enticing everyday and special occasion recipes, suitable for every cook and every skill level. Superbly clear step-by-step instructions ensure that each recipe is easy-to-follow and success is guaranteed. In this book there are tempting recipes for every occasion - you can rustle up mouth-watering meals in minutes for a quick midweek meal, or create sumptuous feasts and dinner-party dishes to impress family and friends. There are recipe ideas for soups and appetizers, salads and side dishes, vegetarian choices, fish, poultry and meat, as well as plenty of delicious desserts to try. The recipes include familiar classics that have stood the test of time, such as Irish Stew, Beef in Guinness, and Cottage Pie, all suitable to serve a family, and there are plenty of well-known dishes from around the world, such as Potato Gnocchi with Sauce, Creole Jambalaya, and Middle Eastern Lamb Kebabs. For a delicous dinner party you could choose a fabulous starter or soup such as Chicken Liver Pate with Marsala, Hot Tomato and Mozzarella Salad and Haddock and Broccoli Chowder, serve a Normandy Roast Chicken or Salmon with Herb Butter, and then end your meal with a great tasting dessert like Apple and Blackberry Nut Crumble or Boston Banoffee Pie. Each of the 500 recipes is illustrated with a colour photograph showing what the finished dish looks like, and there are nutritional notes for each to help with menu planning. This comprehensive cookbook is an essential resource for every kitchen. 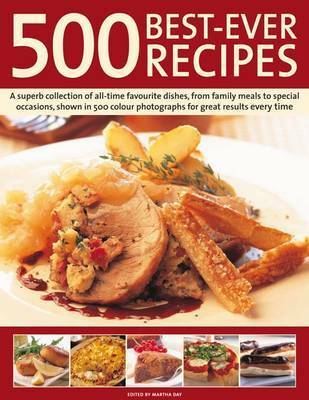 Martha Day has compiled this comprehensive collection of recipes from a team of leading cookery writers. Martha has contributed to many cookery publications and magazines, including 500 Cakes & Bakes, Cooking for Christmas, the 1000 Recipe Cookbook and Baking (all published by Lorenz Books). She is a keen home cook and enjoys baking for friends and family at her house in the country.